For many, the word museum triggers memories of dull school trips, glazed over eyes and an immediate need to nod off, but museums don’t need to be boring. Like most things, Japan does museums a little differently – some would say perhaps a little weirdly. From poop, to cats, to cup noodles, here’s a guide to some of the more unique museum experiences you can try when you’re in Japan. Yep, Tokyo is home to a sewerage museum. Located by Tokyo bay, the museum is all about the disposal (and cleaning) of used water. If you’re brave enough to dig deep into Japan’s world of sewerage there are a number of exhibits ready for you to explore. Apart from displays covering the mechanics behind the dirty sewerage, what’s most fascinating about this museum is located on the B5 Floor, hidden about 25 meters deep underground. Labeled the ‘Fureai Experience Room’ this exhibit is where visitors are able to stand on a bridge spanning an actual, working wastewater tunnel. It’s recommended you visit before you eat your lunch. Given that Japan is a food-obsessed nation, it only makes sense that the country’s unofficial national dish, ramen, gets its own museum. As adored internationally as it is inside of Japan, what’s so great about ramen is its versatility. There are as many types of ramen as there are people who eat it, and at the Yokohama Ramen Museum you can explore as many variations as your stomach can handle. Built to look like Shitamachi, the old town of Tokyo, the double storey building houses nine separate vendors each sharing their own unique recipes. Though it’s more of a fancy food court than a museum exactly, it’s definitely worth a visit if you’re in Yokohama and are interested in eating your way through Japan. ‘Tobacco and salt? Why is there a museum about these two, and why together?’, is what most visitors ask themselves when they stumble upon this seemingly strange but actually very informative museum. Well what actually links these substances together is their shared history for once being goods controlled by the Japan Monopoly Corporation (now known as Japan Tobacco Inc.). Though it may not be your first choice for museum themes, it is worth a visit if you’re interested in exploring Japan’s economic and social history through a slightly different lens. It’s also home to permanent exhibitions like The World of Salt which is all about the variations between Japanese and foreign salt. It’s only 100 yen (US$0.92) admission so it’s worth going just to say you did. #たばこと塩の博物館 の外観 #tobaccoandsaltmuseum #담배와소금의박물관 #日本たばこ産業 #jt #japantobacco #煙草 #菸草 JTの前身は #日本専売公社 で、たばこと塩を専売していましたが、現在は食卓塩などの塩は 公益財団法人#塩事業センター が扱っています。でももう切り離せない #たばこ と #塩 JT는 한국담배인삼공사가 민영화되고 KT&G로 된 듯이 일본에서 담배와 소금을 제조 판매한 일본전매공사(日本專賣公社)가 민영화된 기업입니다. Japan loves cats, cat cafes, cats in kimonos, Hello Kitty, Tashirojima aka ‘Cat Island’, Cat Street in Harajuku, so really it only makes complete sense that there’s a museum dedicated to cats. Located in Ito, in the sunny prefecture of Shizuoka just a few hours from Tokyo, the Cat Museum is feline fandom heaven. There are approximately 2,000 cat related items on display. From stuffed tigers and cat dolls to scientific displays. But the best part of the whole experience is the fact that visitors can also see and play with about 50 cats inside in the museum. If you were looking for the perfect place to get those goofy holiday snaps, this is the place to go. Filled with optical illusions and interactive artworks, the Trick Art Museum in Tokyo’s Odaiba island is a popular destination for both locals and international guests alike. The exhibit displays feature works of varying themes, from the spooky to the brain warping. They also have an “Edo Area” themed room for those wanting to get a little bit of Japan’s history in their hilarious pictures. Don’t forget to charge your camera! Another Yokohama stop off is the Nissin Cup Noodles museum. Situated near the popular tourist destination of the city’s bayside, this tastefully minimalist museum looks more like an ultra-contemporary art space than the home of cup noodles. Inside the monolithic museum, there’s a mini-cinema, which screens a regular feature on the history of the cup noodle, a make-your-own cup noodle laboratory and art gallery dedicated to the popular convenience food. It sounds like a strange place to visit, but the museum is actually a fascinating look at the history of Japan’s ingenuity. Mayonnaise is so loved throughout Japan that they have a specific word for those who love it: ‘mayola’. 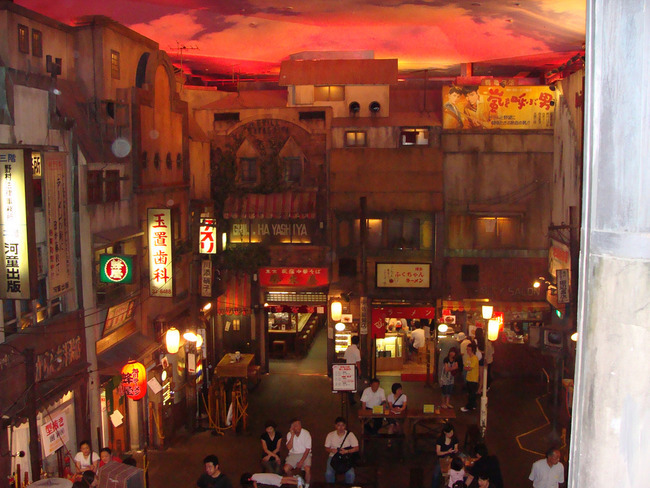 If you’re a self-confessed mayola it’s time to celebrate because Tokyo is home to the mayonnaise wonderland the Kewpie Mayo Museum, aka MayoTerrace. Located in Chofu, the MayoTerrace has a factory, and mayo history lesson gallery, a huge walk through mayo bottle and a mayo-making kitchen. If that wasn’t enough there’s also a giftshop stocked with ingenious mayo related paraphernalia. Though it is a little more targeted towards children, nobody is going to stop you from living out your mayo-covered dreams. Is there anything that sounds duller than a paper museum? Probably not, but actually Tokyo’s Paper museum is anything but. It’s a peaceful exploration of Japan’s history and the perfect place to decompress after dealing with the manic energy of the city. For origami enthusiasts, it’s a must-stop destination, because as well as exploring the permanent exhibitions, you can also participate in workshops, including one that lets you handmake your very own one of a kind paper.